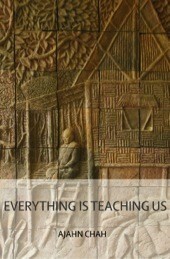 Everything is Teaching us – A Collection of Teachings by Venerable Ajahn Chah. A great thing about the Theravada tradition is that all books are given away for free. As they say: “The gift of Dhamma surpasses all other gifts.” This also goes for this work “Everything is Teaching us – A Collection of Teachings by Venerable Ajahn Chah”. Here Ajahn Chah stresses the importance of not solely associating the path with the traditional methods like monastic life, meditation and following the guidelines from the scriptures. In this book he teaches his students to open their eyes and become students of everything. In this book he teaches his students to open their eyes and become students of everything. I have downloaded and read numerous books from your website….a million thanks for your generosity…God bless! The gift of Dhamma surpasses all other gifts!